Written & directed by Ryan Redford. Starring: Garret Dillahunt, Donal Logue, and Molly Parker. That’s the conundrum of Oliver Sherman, too: there really isn’t anyone or anything to care about. The film begins with a quiet man walking away from a quiet bus stop in a quiet small Canadian town. That quiet (very quiet) man is Sherman Oliver (Garret Dillahunt). On a whim, Sherman shows up at the home of his former army buddy, Franklin (Donal Logue). Seven years before, Franklin risked his life on the battlefield to save Sherman. Sherman has ever since been wandering aimlessly – he’s become a hopeless nomadic figure due to the cruelty of war. Franklin’s wife, Irene (Molly Parker) isn’t thrilled with Sherman’s appearance. She’s accommodating at first, but when it becomes apparent that Sherman intends to become a permanent guest in their household, she’s really put off. Her frustration isn’t helped by the fact that Sherman is a real creep. He stares a lot – at her, at the kids, or vacantly into space. He’s also a relentlessly morose figure, and can’t be bothered to find any sort of purpose in life beyond cashing in his war wounds for all he can get. Sherman’s directionless could have been a meaningful way of exploring the traumas of war, but Oliver Sherman never really gets beyond the surface. The best it does is having Sherman mention that while in the hospital, he thought his name was really Oliver Sherman and not Sherman Oliver. War might make things a little backwards, but what else? Moreover, the more that Sherman and Franklin discuss their combat history, the less Oliver Sherman feels less like a meditation on Canada’s role in international conflicts, and more like a victim of Americanization. I thought Canadian soldiers were more like peacekeepers and less like G.I. Joe. Also, nothing really happens in Oliver Sherman. For a film that clocks in at only 82 minutes, it’s unbearably drawn out. The film is based upon the short story “Veterans” by Rachel Ingalls and it proves that some narratives are best served by brevity. The slowness of the film is amplified by the relentless silence of the production. Scenes pass for moments without any dialogue or music. It simply makes for dull viewing. 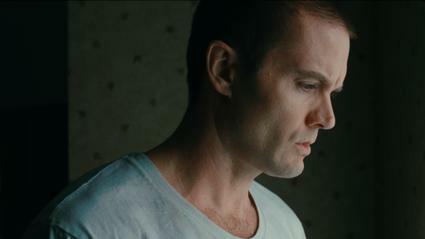 It’s too bad that Oliver Sherman isn’t more appealing, because it features an admirable performance by Garret Dillahunt. Dillahunt, perhaps best known as a character actor with memorable turns in No Country for Old Men and “Deadwood”, makes an impressive evolution from supporting player to lead. He really taps into the tormented psyche of the character, so it’s unfortunate that the film never really takes Sherman anywhere. Molly Parker also makes the best of her limited role: Irene is mostly relegated to the “bitchy wife” character, which Parker does just fine, but she’s only given a few scenes in which she can demonstrate her superior dramatic range. The same can’t be said for Donal Logue, though. Unfortunately, he’s agonizingly monotonous as Franklin, and his scenes nearly halt the pace of the film.